Scalped A Couple Trades Today. Closed out $MAKO for a 2 day trade. I bought yesterday 1000@$12.30 and sold today for $12.75 after seeing a tweet. There is good amount of short interest in this stock and they covered even after a disappointing earnings news. 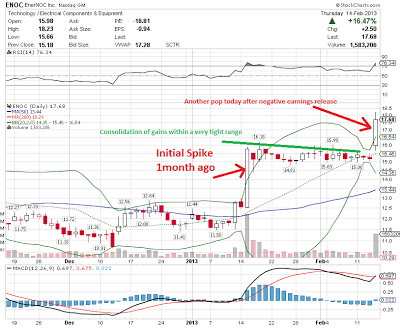 The volume and price action made this a good momentum play. 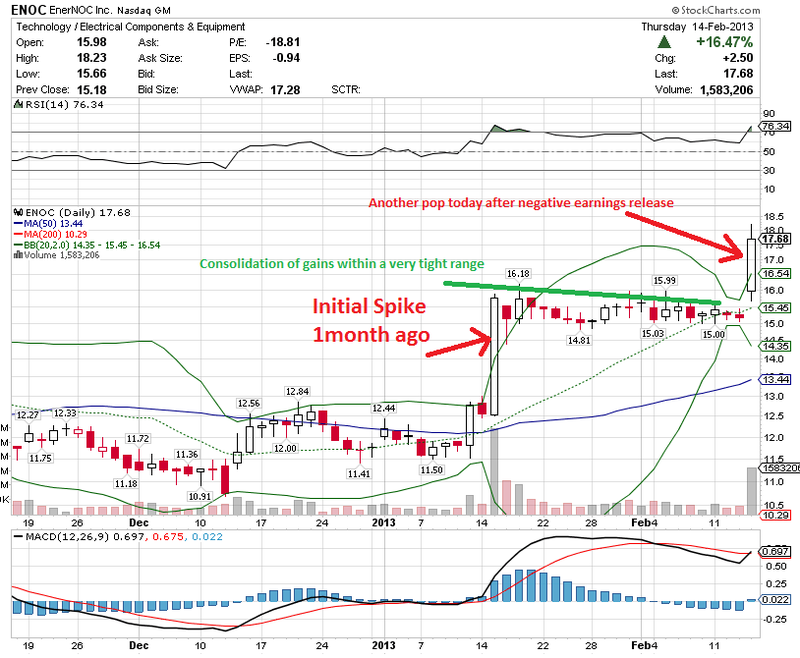 Got stuck long some $DECK two weeks ago, sold some covered calls against the stock Luckily earnings was not bad today. After the bell and the stock has jumped almost 8%. This one has around 40% short interest and should continue to run. I should make money on the calls and the stock. This should bring my personal portfolio back to my 2013 high. Took a short position in PHM, Pulte is a low end home builder. Home builders had a great 2012, but the stock has started trending down. Usually, last year winners turn into the loser for the current year. My passenger side headlamp has been out on my 2008 Lexus RX400h. Its been like that for a few months now. I was pulled over by the Pflugerville Police and they gave me a warning. I guess it is illegal to drive without a headlamp in Texas. The headlamp also had allot of condensation inside. The water seem to clear up during the winter months. I took the RX400h to the Lexus dealer and they said that the entire assembly, ballast and bulb would need to be replaced. Total cost $1900! The cost break down was $1000 for the headlamp assembly $500 for the ballast, $200 for the bulb and $200 for labor. I called Lexus Customer Care telling them that it seem widely expensive for one headlamp. They agreed to help by taking 10% off. I did have to wait 2 days for there answer. I decided not to get the work done at the Dealership. I purchased a ballast on Ebay for $127. I sealed the edges with some clear silicone sealant for $5. I went to my neighbor mechanic and had them removed the bumper and replaced the ballast. Everything worked fine. I think the original bulb worked fine too, but we replaced it with the $12 bulb I got on Amazon. The labor was $200 for 2 hours of work! The mechanic said there was allot of corrosion around the ballast, probably due to water damage, so hopefully my sealant will help water proof the ballast for a few years. I got a job offer to trade for a living with Mavrick Trading. Mavrick Trading is a Proprietary or Prop trading firm. I had my interview last Thursday and they let me know tonight, Monday, that I could trade with them. I would work from home. There is a two month training period and Demo period where I have to demonstrate what I can do for them. Then I would start with $25K and start working my way up. I would have to sign the following Member Agreement. What’s making me question them a bit, is that they make you pay $5K upfront for training and then a $199/month desk fee, then another $5K as risk capital. I would keep 70-75% of my profits and they would take the rest. Trading is thru Interactive Brokers and commissions look to be the lowest in the industry. At the end. I decided to decline the offer. It is a job where you have to pay them to work and they take a 30% cut of your profits and you still have to pay income tax on that. So you would only net 50%. I have my own capital and better off just risking my only money and keeping 100% of the profits. Scalped some $DDD from $35 to $36 in 30 mins! 3D printing is such the rage these days. I first saw these machines in 1996 when I worked in a Tool & Die shop! It has taken this long to develop and prefect the technology. You can even find bit torrents files of some 3D print files. ENOC popped today after negative Earnings. How can that be? This company had a net loss was $25.8 million, or $0.76 per share. I sold in the morning pop after holding for a few days. I saw the consolidation run and felt that it could pop after earnings news. Looking at the chart it had pop one month ago and has been consolidating until today! It was classic technical action, even though the fundamentals stink, it really doesn't matter when people want to own the stock or want to cover a short position. 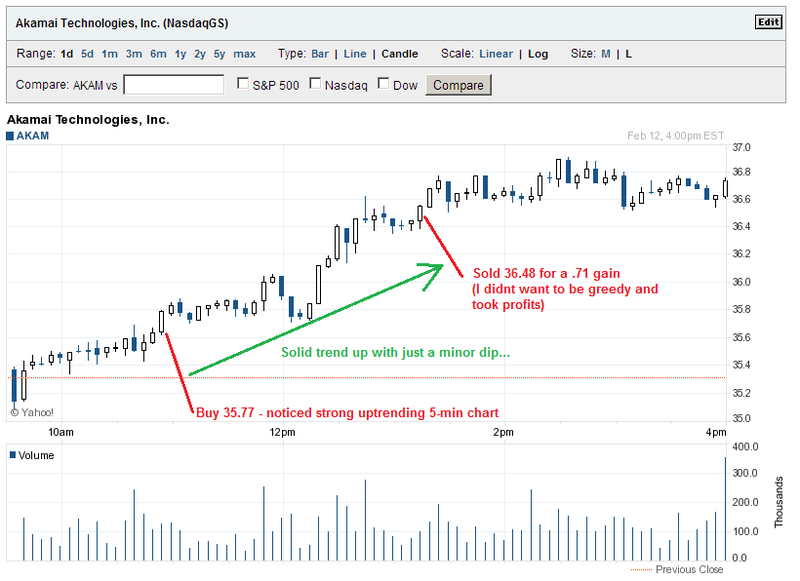 When looking for a stock to buy, it best to look for this classic chart pattern. The collapsing Bollinger bands is also another great indicator of a big moving is about to happen. YY finally popped today after consolidating for a few months. This was one of my first stocks I purchased on Jan 3rd. I had to wait longer than I wanted to, but it was worth it. I sold for a nice gain. It could have been more, but I'm not complaining, since any profit is better than a loss. I scalped a short trade with GNRC. It was already bottoming out, so took some quick profits. Should have waited until the end of the session, since it sank even further, but again any gain is better than a loss. Still holding 17.50 SCTY puts. The stock popped back up over $18.50, so the options should expire worthless for a nice gain for 3 days of insuring a stock! I knocked out a couple quick trades today. $AKAM had spiked down on Earnings news a few days ago. I was waiting for a bounce and the setup materialized today. I bought at $35.77 and sold at $36.48. It was a few hours trade. When it works, it just works.. Lesson "Go with the Flow, Don't fight momentum"
I also tried $MLNX again. It has lots of shorts, but after buying at $52.35, it began to drop to around $52.00. I didn't feel good about it and the 5-day chart looked to be down trending, so when it spike back up, I sold at $52.48 Good thing I did sell, it ended the day at $51.88, but I still made a small profit of $45! Lesson: When a trade doesn't work out as plan, cut your losses and try to minimize losses as much as possible. Decided to make an option play. Sold some 17.50 puts on $SCTY. 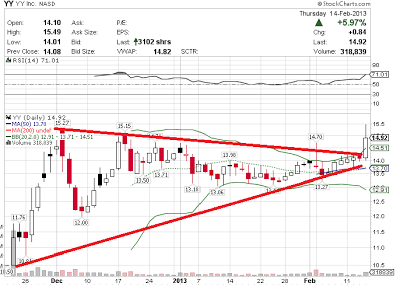 Its a solar play and hoping that the stock stays above $17.50 for the week. It has broken out of a range and looks to have some solid support. If it breaks below my strike, then I will have to buy at $17.50, but since I got .45 for the puts that would make my buy-in just 17.05. I love to sell naked puts. It is basically selling insurance on a stock. You are paid to protect a stock from falling below a certain price. If the stock does fall below that price, than you have to buy the stock at the strike price. If the stock stays above the strike price, than you keep the premium for having to insure the stock. This methodology has limited up side potential, but has a high probability of success. Where if you are the buyer of a put, you have unlimited up side potential, but high probability of losing everything. In percentage terms, I would say that 80% of the time you win when selling puts. 20% of the time you lose or the person buying the put wins 20% of the time. Selling puts is a slow and steady way to make income. Buying puts is a gamblers bet, hoping that a stock will move in a define period of time. I rather take the high probability play, than the low probability play. Just one thing to remember, never sell more puts than you can actually cover. You can easily over extend your margin if you sell to many puts and the stock craters. Basically, be prepared to always have enough capital to cover the entire position, in case the worst happens. In this way, you would be no worst than just buying the stock at the market. Actually, if you plan to buy any stock, you are better off selling puts instead and hope the stock gets put to you. In this way, you get the stock at a cheap price and if the stock does go up, you still made money on the time premium. In many ways, selling puts is actually safer than buying a stock. Example: I sold 2 AAPL 480 puts 3 weeks ago before earnings news. I got $5/share or $1000 for the puts. The stock was trading around $515. Well, AAPL sold off after the news, down over 10% to around $460. Now my puts went from $5 to $20!. AAPL traded as low as $445 days afterwards and the puts went as high as $35. Expiration came and I was forced to buy 200 shares at $480. Good bye $96K.. I was prepared to buy it. Heck I was buying a $515 stock for $480, who knew it could drop by $70. But now Im long the stock. I held my ground and AAPL has bounced back 3 weeks later to $479 today and now Im actually making a profit! I also sold some weekly calls against my stock, to further decrease my buy-in. Apple is on a tear and watching for a squeeze play. Im glad I covered those 465 AAPL calls. Because they went from $.95 to over $10 after AAPL when up over $15. It blasted thru my strike price by $10! I did sell the 480 calls for .75 and they expired worthless on Firday as AAPL was pinned to $475. With the hedge removed, I can reap the benefits of any further gains. 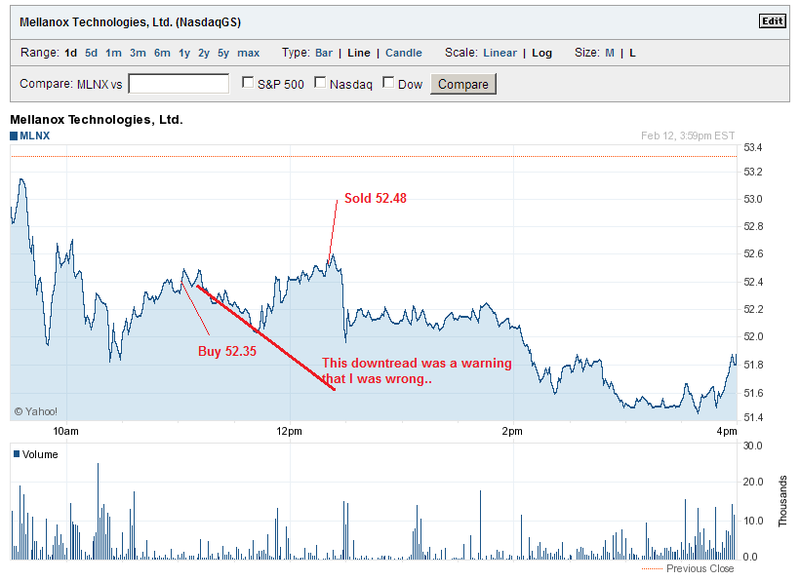 I did try to make a day trade of $ROSG. Its an Israeli biotech company with 71% short interest. It looks to have form a solid base between $4.5 and $5. I was hoping for a quick spike above $5. I purchased at $5, but it never really made a move until the final minutes. I sold early at $5.07 Ill keep watching, The last squeeze play was in May 2012 where it went from $2 to over $25! It was an active morning today. I closed my DECK trade from yesterday. It had a nice pop in the morning. I purchased 1000 shares at $41.50, held overnight and sold for$42.02. A $500 profit after commissions. I think it has room to run, but am not going to be greedy. I covered my two AAPL $465 calls that I sold. I would have had to sell my AAPL stock for $465, if the stock was above this price after Friday's close. I feel AAPL has room to run. It went ex-dividend today but did not trade lower by the dividend amount. I should be getting a nice $2.65 dividend next week or about $530. I also covered my FB short from yesterday. I shorted 1000 shares at $28.90 and covered at $28.45 There are to many insiders selling and I feel the stock is over-hyped. It traded wildly after earnings, but clearly trading down. It's probably heading to $20. All told, closed about $1700 in profits! Monday the markets suffered its biggest decline for 2013. The major indexes were all down over 1% and my portfolio took a hit. I did close out PPHM for a nice gain, but nothing else was working. I tried a play at FB, but got stopped out for a small loss. I got into UNXL and that didn't work either. I decided to hold overnight and today was a complete reversal. All the losses from Monday disappeared and Im back to my all to time. I close UNXL for a nice gain and held on to my AAPL shares and 1 naked put. We went from my worst losing day to my biggest gaining day of the year! Lesson: "The Trend is your Friend..."
Its been a great start to 2013. My portfolio is up more in one month, than what I made for all of 2012. The market is in bull market mode. There are plenty of reason to be bearish now, but we continue to march higher. The mainstream media cant explain it. The economy is shrinking and unemployment is still stubbornly high. We are "climbing the wall of worry," despite the fundamentals being weak. This is the best time to be momentum trader, despite all the warning signs. Here is my reasons why the markets continue to march higher. After Obama got re-elected, many traders got short. The market drop almost 1000 points. The media said it was worry about the 'fiscal cliff', and when that didn't happen, market participants shorted even more stocks. After we got a fiscal cliff, the shorts had to cover and the market spiked up. The shorts have been covering ever since and have even remounted with more shares shorted, fueling the fire. We wont go up forever, but my theory would be any dips will be bought quickly, as professional money mangers try to get ahead of the markets. Below are all my closed trades for Jan. 2013. I did not take any losses until the final days for January. No body is perfect and I had to use my own advice and minimize my losses to keep my gains. I took profits in DECK after a $.55 gain in about an hour. 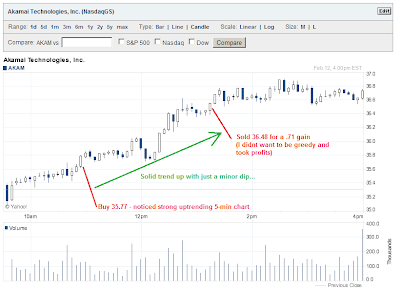 The stock did proceed to climb another .35, but after hitting a high of $40.61 it started a downtrend ending the data at $39.92. If had had held, my profit of .55 would have ended with a gain of only $ .22 and emotionally, I would have felt bad for not taking the gains when I had them. 1. Follow the Trend, don't anticipate the trend. The Long term and short term trend in DECK was up. After bottoming around $39.41, it spiked to $39.80. This was my trigger for a reversal to the main trend. I waited to for it to dip back to $39.70 and held for 1 hr for a quick .55 gain. 2. Bulls make money, Bears make money, Pigs get slaughter. Dont be greedy in trading stocks. Take gains when you have them, not when you have too. There is always tomorrow for another trade.